I love Gustav Klimt’s paintings of trees, especially the highly stylised Tree of Life which the Austrian artist completed in 1909 as a mosaic wall frieze for the dining room of the Palais Stoclet, Brussels. The enormous preparatory drawings (central section pictured left) are in the permanent collection of Vienna’s MAK Museum, where they are displayed alongside other Jugendstil (Art Nouveau) and Art Deco exhibits. 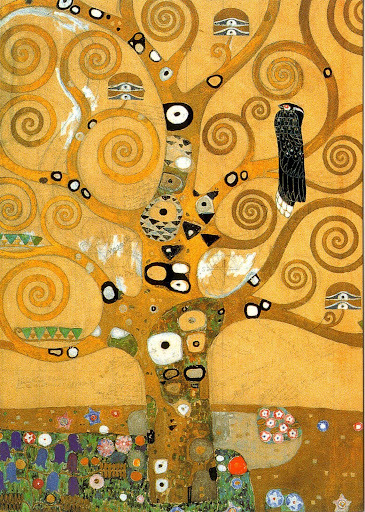 When I showed them photographs of the Tree of Life, the kids also loved the spiral forms and Klimt’s use of gold. Drawing spirals is a skill that children learn during the preschool years, so recreating Klimt’s masterpiece was a fun challenge for both of the age-groups that I teach. I did the project first with the older group (aged 4-6). Working on brown paper, they used white coloured pencils to draw the tree trunk and then the branches with their spiral forms. Then they painted over their lines with fine brushes dipped in gold acrylic paint. It was quite a challenge for them to control the paint and the brush to make the spiral shapes, but with a little practice they all got the hang of it! I learned from the first session that doing preparatory drawings was actually unhelpful, as lots of the children drew very intricate spirals that were very difficult to paint over accurately with a brush and sloppy paint! 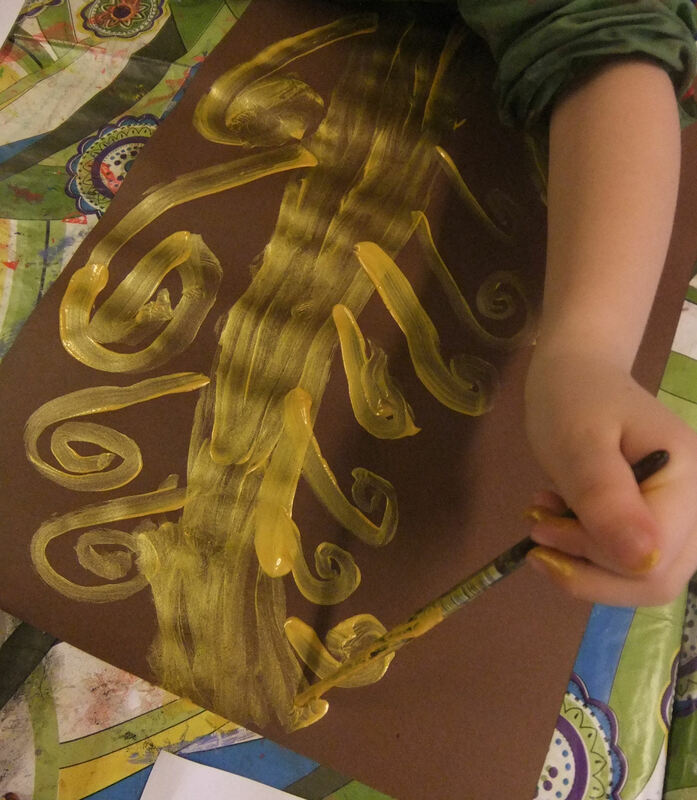 So with the younger group (aged 3-4) I got them to practice drawing spirals on a piece of scrap paper first, before letting them loose with the brushes to paint their golden trees directly onto the brown paper. This worked much better, and I was really impressed by how well they painted the spiral shapes. 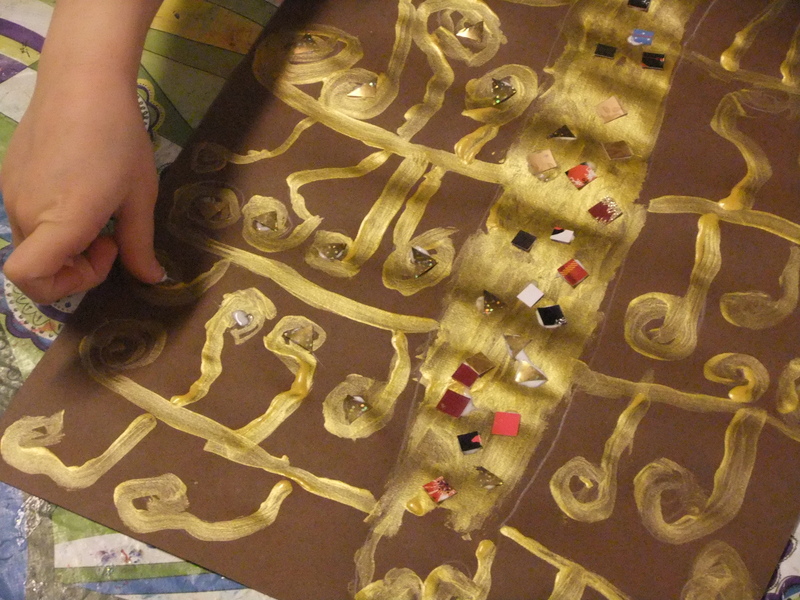 To create the mosaic effect of Klimt’s original Tree of Life, the children added decoration with little squares and triangles cut from shiny and sparkly Christmas cards, and finished off by gluing on some large, metallic gold, orange, red and green sequins for extra sparkle and shine. What do you think of the children’s Klimtesque artworks? Such wonderful, magical, alchemical paintings done by the children. Thank you for sharing.